As the warm weather arrives, we all want to be outdoors as much as possible. However, cool, damp mornings can leave many outdoor patios vacant during the breakfast hours. Whether you operate a restaurant, coffee shop, or hotel, retractable fabric structures give you the options you need to create the ideal environment for your sunrise guests. 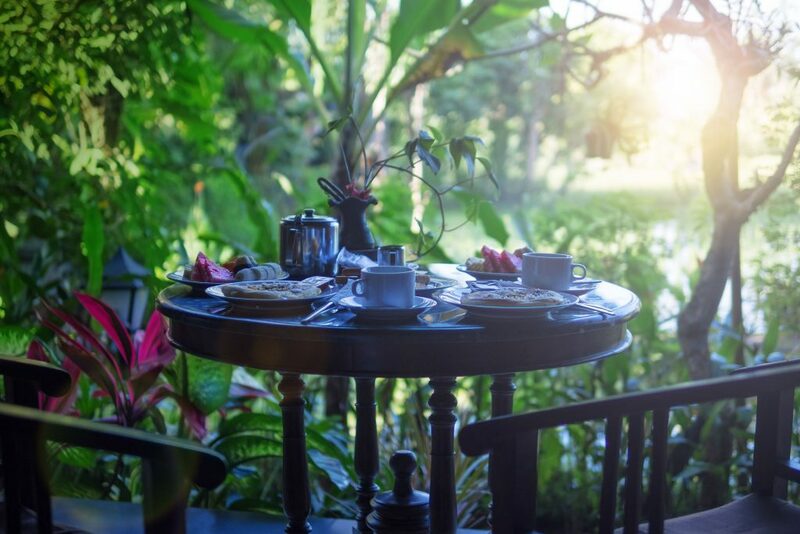 Here are some tips for creating a comfortable breakfast setting regardless of the weather conditions. First and foremost, the furniture on an outdoor patio has to be dry for guests to be comfortable. Even if rain isn’t forecasted, morning dew soaks into cushions and pillows. Either cover your furniture at night or bring the fabric elements indoors. If your outdoor furniture doesn’t currently have cushions or pillows, consider adding some, as they provide a cozy warmth to plastic, wood, or metal seats. Similar to cushions and pillows, table cloths or placemats protect guests’ arms and hands from a chilled table surface. Additionally, they add a visual appeal and attention to detail that your guests will love. Retractable roof structures give you the option of shielding your guests from the elements when needed or opening the space up to the warm morning sunshine – at a push of a button. When expanded, retractable roof structures can help to protect your space from that morning dew we mentioned above. Whether you’re looking for the best options for protecting guests from the rain or you’re more concerned about wind, there are a wide range of products designed to address your needs. Outdoor heating systems have become increasingly affordable over the past years. Especially when paired with retractable roof structures, they are incredibly effective at creating a warm open-air environment. As the heat rises, the roof system helps to keep it from escaping. The design team at Retractable Structures can help you create a safe and comfortable solution for your outdoor patio. Are Retractable Fabric Structures Right for Your Commercial Property?